There is a lot of misunderstanding about what May Contain means when it shows up on a food label in Canada. The two biggest misconceptions are that 1) it is simply a legal disclaimer used to reduce getting sued, and 2) that it must be used whenever there is a gluten source present in the plant. Neither of these things is true. May Contain is a VOLUNTARY statement in Canada. Manufacturers can choose whether or not to use it on their packages. There is no requirement to use them and there is no prohibition against using them. The only requirements are that they be truthful and that they are not a substitute for Good Manufacturing Practices (GMPs). Good Manufacturing Practices are not a set of “thou shalt” statements, they are a series of general principles that must be observed during manufacturing to make sure that products are safe for consumption and are produced in controlled conditions that prevent cross-contamination with allergens or other hazardous ingredients. To quote Health Canada, “Precautionary labelling should only be used when, despite all reasonable measures, the inadvertent presence of allergens in food is unavoidable. It must not be used when an allergen or allergen-containing ingredient is deliberately added to a food. Furthermore, the use of a precautionary statement where there is no real risk of an allergen being present in the food is contrary to the Department’s goal of enabling a variety of safe and nutritious food choices for the allergic consumer.” Source: The Use Of Food Allergen Precautionary Statements On Prepackaged Foods. The U.S. Food and Drug Administration has published a new regulation defining the term “gluten-free” for voluntary food labeling. This will provide a uniform standard definition to help the up to 3 million Americans who have celiac disease, an autoimmune digestive condition that can be effectively managed only by eating a gluten free diet. The FDA recognizes that many foods currently labeled as “gluten-free” may be able to meet the new federal definition already. Food manufacturers will have a year after the rule is published to bring their labels into compliance with the new requirements. “We encourage the food industry to come into compliance with the new definition as soon as possible and help us make it as easy as possible for people with celiac disease to identify foods that meet the federal definition of ‘gluten-free’” said Michael R. Taylor, the FDA’s deputy commissioner for foods and veterinary medicine. The term “gluten” refers to proteins that occur naturally in wheat, rye, barley and cross-bred hybrids of these grains. In people with celiac disease, foods that contain gluten trigger production of antibodies that attack and damage the lining of the small intestine. Such damage limits the ability of celiac disease patients to absorb nutrients and puts them at risk of other very serious health problems, including nutritional deficiencies, osteoporosis, growth retardation, infertility, miscarriages, short stature, and intestinal cancers. The FDA was directed to issue the new regulation by the Food Allergen Labeling and Consumer Protection Act (FALCPA), which directed FDA to set guidelines for the use of the term “gluten-free” to help people with celiac disease maintain a gluten-free diet. Why Don’t They Just Call it Gluten Free? I have heard a lot of complaints recently about products that have no gluten ingredients and no warnings on the label about gluten, but when the company is contacted, they do not identify the product as gluten free. Sometimes the response from customer service is that there might be gluten in the spices or flavouring; sometimes it is that there is a possibility that the product might have come in contact with gluten. The comments from our members: What use are labels? Why don’t they just call it gluten free?. A “gluten free” claim has a special meaning beyond “there is no gluten in the product”. In Canada’s Food and Drug Regulations, section B.24.001, it is defined as a “food that has been specially processed or formulated to meet the particular requirements of a person a) in whom a physical or physiological condition exists as a result of a disease, disorder or injury …”. In the case of gluten free products, this means that the product has been formulated for someone with celiac disease. It is easy to understand how a loaf of gluten free bread has been formulated to meet the needs of someone with celiac disease. Soups made without hydrolyzed wheat protein, licorice candy made with rice flour instead of wheat flour, snack bars made without outs – it is easy to see how all these products were formulated to meet the need of people with celiac disease. It gets much more difficult to make that claim when you are talking about ketchup or salad dressing or cocoa, however. Not using a gluten-free ingredient when gluten free ingredients are not normally used does not meet the criteria of a food specially formulated for someone with celiac disease. Putting a gluten free label on those products might be questionable. The products may be safe for someone with celiac disease, but they will not carry a gluten free label. There is one way that the companies might be able to make this claim for a product that does not generally contain gluten – if they have introduced a food safety program that includes controlling gluten as a food safety hazard, they have specially processed the product to meet the needs of someone with celiac disease. Manufacturers who have met the requirements of the CCA’s Gluten Free Certification Program, for example, have done this. Every person with celiac disease needs to figure out how they will decide which products they will consume. The CCA has recommended reading the ingredient list and choosing products that do not contain gluten in the ingredient list or a “may contain” statement. In addition, they recommend choosing flour products where the manufacturer has made a gluten-free claim. Requiring a gluten-free claim will minimize your gluten exposure, but it will also limit the number of products available to you. If you decide that is going to be your criteria, you need to reconcile yourself to this fact or you are going to spend your time feeling deprived and frustrated. Set your criteria and be confident in your decision. Right now we don’t know if small amounts of gluten are a problem for people with gluten sensitivity, the CCA does not recommend that anyone with celiac disease or gluten sensitivity consume pizzas from Domino’s. According to company spokesman Barry Langhodge, the crust is gluten-free but they are NOT selling a gluten-free pizza. The crust is made in a dedicated gluten-free facility. It arrives at the restaurant individually wrapped and ready to cook from scratch, but there are no practices in place to avoid cross-contamination as the toppings are added, the pizza is cooked, and the pizza is boxed up. The CCA hopes to work with the company to develop policies that will allow them to sell a gluten-free pizza, not just a gluten-free crust. New labelling regulations in Canada come into effect today (August 4, 2012). While manufacturers have had some time to implement the new regulations, some products may not meet all the requirements immediately. While the CONTAINS and MAY CONTAIN statements are helpful in identifying top allergens and gluten, always read the ingredient list. The new regulations require that the ten priority allergens, gluten sources, and added sulphites of 10 ppm be identified using plain language either in the ingredient list or in a Contains statement that appears immediately after the ingredient list. Manufacturers have a choice about which method they choose to use. The WARNINGS section – CONTAINS, MAY CONTAIN. Start with the WARNINGS. You are looking for wheat, rye, barley, oats or gluten. If you see wheat, rye, barley, oats or gluten, in either the CONTAINS or MAY CONTAIN list, the product is NOT OK. If there is a CONTAINS statement, and it does not include wheat or a gluten grain, the ingredients are acceptable for a gluten-free diet. If the ingredient list just says oats, assume they are contaminated with gluten, unless they are specifically identified as pure uncontaminated oats or by the source (Cream Hill Estates Oats, Only Oats, etc.). If there is no CONTAINS statement, check the INGREDIENT list. You are looking for wheat, rye, barley or oats. If you see wheat, rye, barley, or oats, the product is NOT OK. If you do not see any gluten source listed, the ingredients are acceptable for a gluten-free diet. Plain names must be used for all allergens – WHEAT, MILK, EGGS, etc. Allergens cannot be hidden in ingredients like seasoning or natural flavour. 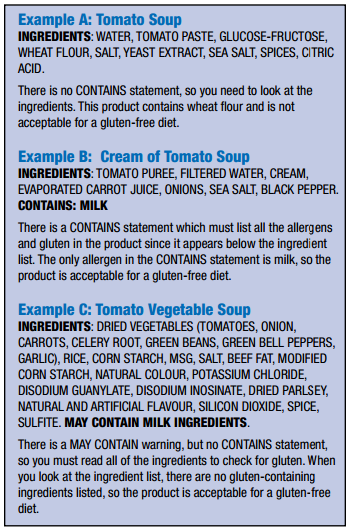 If one allergen is listed in a CONTAINS statement, then all the allergens including gluten must be listed. The only warnings that have official meanings are CONTAINS and MAY CONTAIN. All other warnings (“made in a plant that also processes wheat “etc.) can only be understood by contacting the company. Cross-contamination with gluten can occur in a product despite the use of good manufacturing practices and may not be reflected on the ingredient list. The North American Society for the Study of Celiac Disease (NASSCD) has announced a call for all restaurants and food manufacturers to properly label gluten-free products to avoid confusion that has the potential to threaten the health of people with celiac disease. The move comes after two restaurant chains, Chuck E. Cheese and Domino’s Pizza, last week separately announced new gluten-free food product offerings that provide significantly different levels of safety for people with celiac disease. Celiac disease is a genetically inherited autoimmune condition that can damage the small intestine, and can lead — if untreated — to further serious complications, including anemia, osteoporosis, infertility and even certain cancers. 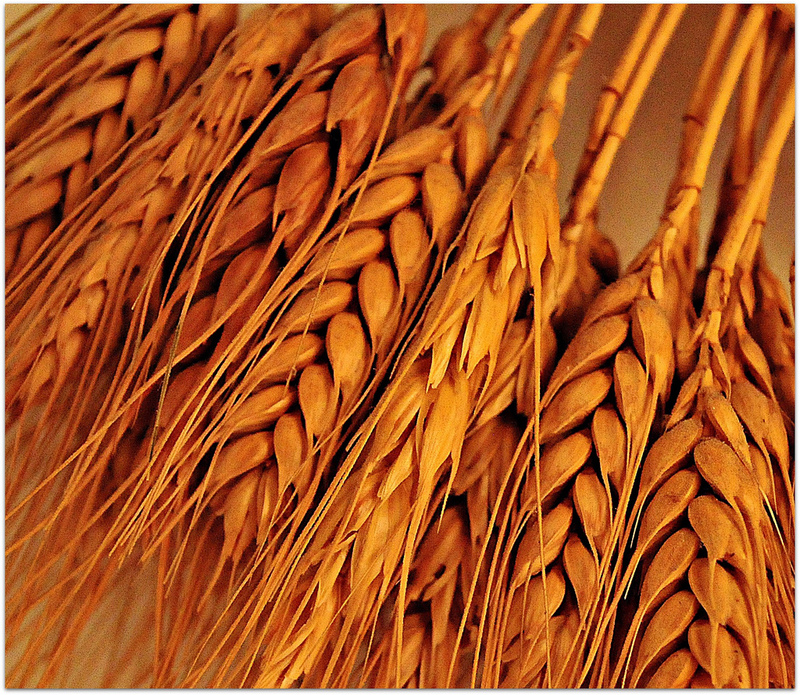 Celiac disease is triggered by the consumption of gluten, a protein found in wheat, rye and barley. The announcements of new gluten-free pizza offerings by Chuck E. Cheese and Domino’s Pizza are a case in point. According to Guandalini, as little as 10 mg of gluten in a day can reactivate — in very sensitive patients — celiac disease. The NASSCD, along with other organizations, has been working with the U.S. Food & Drug Administration to put forth a “gluten-free” standard. That standard would require that, in order to claim a food product as “gluten free,” the end product must contain less than 20 parts per million (ppm) of gluten (equivalent to less than 20 mg in about 2.2 lbs.). Anything short of this standard would be considered false advertising. The NASSCD was founded last year to advance the fields of celiac disease and gluten-related disorders by fostering research, and by promoting excellence in clinical care, including diagnosis and treatment of patients with these conditions. Approximately 1 percent of the population is estimated to suffer from celiac disease, though the condition often is undiagnosed or misdiagnosed. Non-celiac gluten sensitivity is a less well-understood condition with a broad range of symptoms, including fatigue, migraine headaches and digestive disorders, and whose mechanism or cause is not yet identified, and that presently cannot be diagnosed by any medical test. Visit the NASSCD at www.nasscd.org . The marketing wizards at Domino’s are offering a “gluten-free” crust that may get contaminated during preparation and is therefore not recommended for Celiacs. While the gluten-free fad diet for non-Celiacs has been somewhat helpful in raising Celiac awareness in recently years, Domino’s is now creating a confusing new class of products that claim to be “gluten-free” but are not free of gluten enough for Celiacs to consume them. Meanwhile here in Canada, Boston Pizza figured out how to do it right and as a Celiac I have enjoyed their gluten-free pizza many times without incident. So, next time you are visiting the U.S., be sure to get out your reading glasses and check the fine print on those packages with large “gluten-free” text on it. There maybe an asterisk saying “not suitable for Celiacs”. Please note: This article is my opinion only and does not necessarily reflect that of Kelowna Chapter or the CCA. Have your say. Use our comment box below. Domino’s Pizza is responding to the needs of choice consumers, today launching a Gluten Free Crust available in all of its nearly 5,000 U.S. stores and becoming the first national pizza delivery chain to offer such a product.